Everyone has a thyroid gland. It is a butterfly shaped gland that is found in the front of your neck. This gland is part of the endocrine system which is responsible for producing hormones and regulating the functions of the body. When thyroid hormones are released into the blood they directly control the liver, brain, kidney, heart, metabolism, and immune system. There are two main hormones that are produced by the thyroid gland: T3 and T4. These hormones help to maintain and raise metabolic rate. They also help produce proteins, regulate bone growth, assist in your body’s natural reaction to stress and help form new cells. It’s obvious these hormones produced by your thyroid are imperative to daily functions. However, disease, stress, and genetics can all have an impact on your thyroid and how much of these necessary hormones it produces. When your body is under too much stress it can lead to thyroid dysfunction. This is when your thyroid gland is not producing the amount of hormones that it should be. There are two categories of thyroid dysfunction. If you suffer from hyperthyroidism your thyroid gland is producing too much T3 and T4. If this is the case you may see symptoms such as muscle weakness, irritability, weight loss and diarrhea. On the opposite side of the spectrum hypothyroidism is when your body does not produce enough T3 and T4. Symptoms of this dysfunction include constipation, tiredness, weight gain, and depression. T3 is the hormone that produces the unwanted and dangerous symptoms of both of these thyroid dysfunctions. The goal is to keep T3, specifically, in a natural balance in order to help diminish these symptoms. A major cause of thyroid dysfunction is stress. Consistent stress can weaken the signals from the brain to the thyroid. Once this hormone signal is weakened the thyroid thinks it should ramp up metabolism. When this occurs we have unwanted symptoms and poor resiliency during stressful situations. It is obvious that both of these dysfunctions take a drastic and serious toll on a person’s life. That’s where ashwagandha comes in. 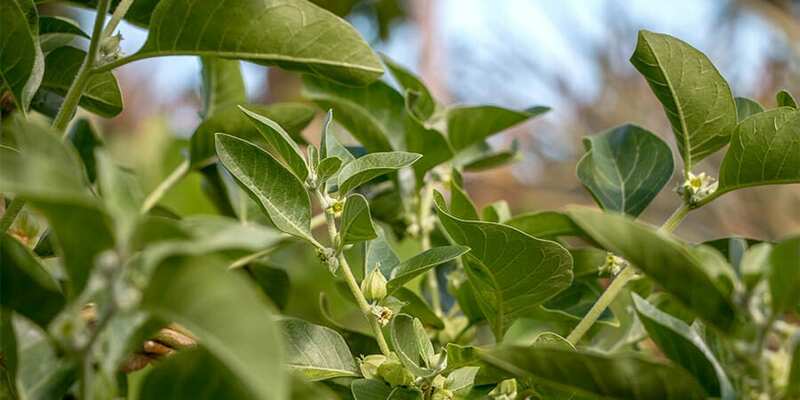 Ashwagandha is a traditional herb that grows in Africa, the Middle East, and India. It had been used in ancient medicine dating back to 6000 BC. The root is specifically used to combat stress and reduce inflammation and anxiety. Sufferers of thyroid dysfunction typically treat the symptoms of their disease. They look to treat the weight gain, depression, or sensitivity to heat. However, we should be treating the root cause of this autoimmune disease. Stress and hormone imbalance. By taking ashwagandha you are directly helping the brain communicate differently with the thyroid gland, in turn lowering stress and relieving the symptoms. After a tough day at the office, a particularly difficult meeting, or another day of feeling like you’re always on the go, your body enters into “fight or flight” mode. This is a state of adrenaline. Your body naturally releases adrenaline and cortisol when under stress. In turn you begin to feel “revved up,” your mind is racing, your heart start beating faster, and you can’t seem to think straight. When taking ashwagandha one of the things it helps with is to subdue this response. You may still feel that adrenaline rush but it will be much more manageable. Ashwagandha has been compared to Lorazepam, a commonly known western medicine anti-anxiety medication. Anxiety, or anxiety-like symptoms, are one of the most common side-effects of a thyroid dysfunction and a definite sign that your body just can’t keep up. In addition to anxiety, thyroid dysfunction sufferers also commonly deal with illness more often. When the body is stressed and over-anxious it’s defense system becomes weaker. Luckily, taking ashwagandha is also known to boost white blood cell count. It can help to combat the common cold, the flu, and in turn helps with fatigue. The thyroid gland, and how it functions, is controlled by two things in the body, the hypothalamus and the pituitary gland. The hypothalamus, which is part of the brain, collects information from various parts of the body and decides whether or not the thyroid should increase its amount of T3 and T4 or if it should decrease the amount of these hormones being released. If the brain does decide more hormones are needed it will send signals to the pituitary gland in order to begin secretion. However, if you suffer from hypothyroidism your brain does not recognize that these hormones are low and are needed. This lack of hormone leads to that anxious feeling, and the other undesirable symptoms caused by this dysfunction. This is the time that ashwagandha comes into play. This herbal supplement tells the pituitary gland to begin producing these hormones. Once enough T3 and T4 have been secreted by the pituitary gland the brain instructs it to stop the production. Ashwagandha helps the communication between the brain and the pituitary gland. In addition, scientists have concluded that people suffering from hypothyroidism can benefit from taking ashwagandha not only because it helps to safely improve T3 and T4 amounts in the body, but it also helps to reduce inflammation and helps improve mood. Ashwagandha has a different effect with those with hyperthyroidism. It still continues to stimulate the increase of T4 levels in the body. Some people will take Indian Ginseng to help keep T3 in natural balances. With increased levels of T4 specifically it will lower the oxidative stress in the body, leading to a decrease in symptoms. T3 is the main culprit for the unwanted symptoms of hyperthyroidism. If T3 levels are kept in balance you will reap the benefits of ashwagandha. As you can see, ashwagandha can not only alleviate the symptoms associated with hyper and hypothyroidism but it actually gets to the root of the problem in order to give you long lasting relief. This herbal root will leave you feeling stronger, more energetic, and ready to take on the day. Ashwagandha is taken in pill form on a daily basis and can be found directly on our website. Stop suffering and start feeling better.